Grier students and faculty enjoyed a fun-filled spirit week sponsored by Student Council. Each day of the week featured a special dress-up day and a special silly competition after school. On Monday, the students dressed up in their monster gear from scary to silly. After school, students representing each grade participated in a Dizzy Bat relay. Students ran across Lodge Lawn to a baseball bat, bent over the bat, and spun around five times before running back to the driveway to tag a team mate. Twin Tuesday meant a bevy of identically dressed "twins," "triplets," and the whole Junior Class! Two sisters donned T-rex costumes for a very unique twin set. 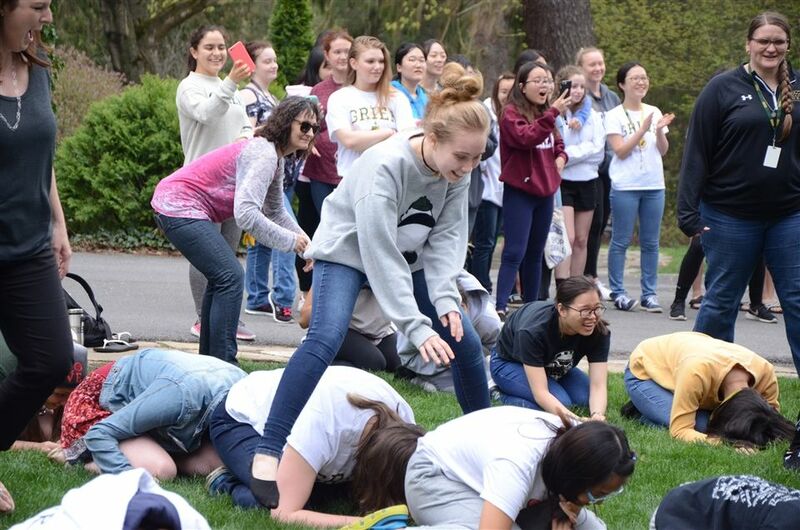 Appropriately for twin day, the after school competition was the three legged race across Lodge Lawn. On Wednesday Grier folk were Wacky from head to toe. 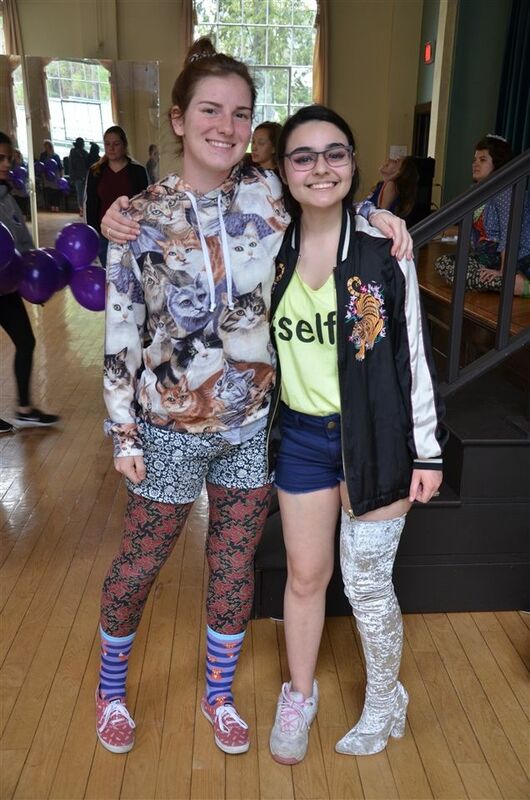 Many students and faculty sported bizarre mismatched outfits, wild hair, and kooky socks and shoes. The after school competition of body balloon pop heightened the silliness. 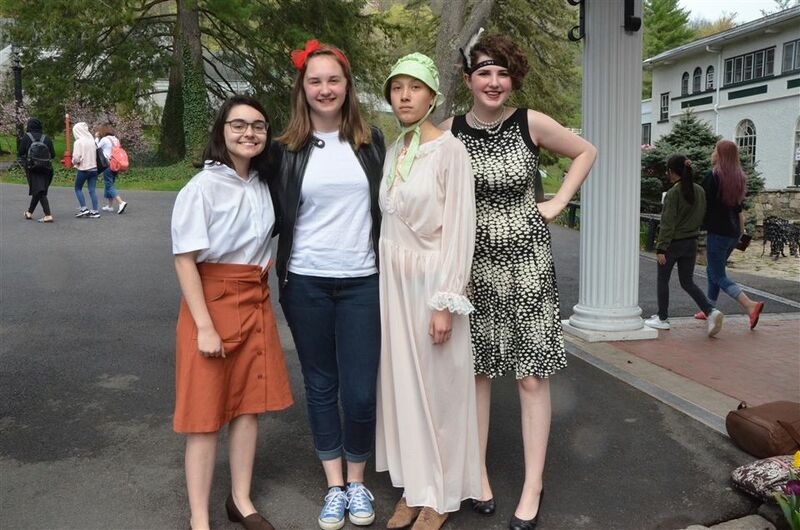 Grier enjoyed Throwback Thursday, where all were invited to dress from any decade. The '80s bubble gum pop and '90s grunge were popular choices, but a few other decades were represented as well, including the roaring '20s and swinging '60s. 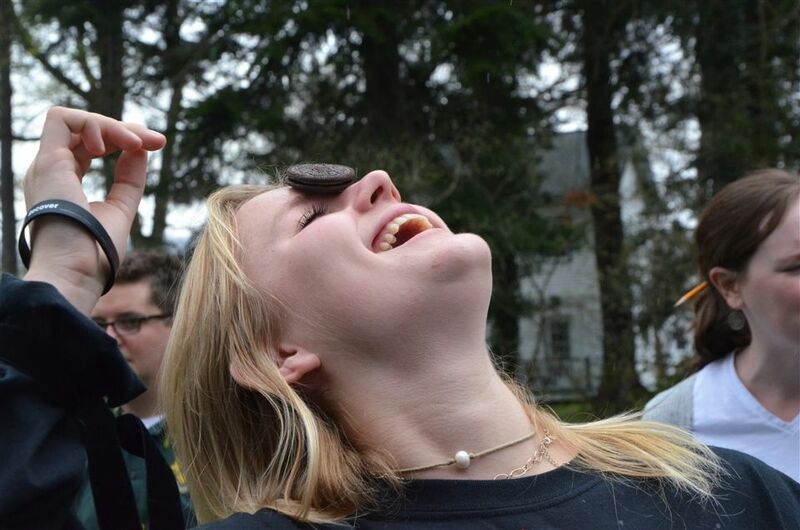 After school, the student classes competed against each other in the amazing oreo cookie face race. Spirit week culminated on Friday, with the whole Grier community sporting their Grier Spirit gear. Grier incorporated an Earth Day event into the Spirit Week, with grades competing to clean up campus. Ms. Crago tallied the wins and announced the winning class for spirit week: SENIORS! For anybody observing the events, it is no surprise the Senior class was the ultimate winner. They won every after school contest, plus one of the dress-up days. 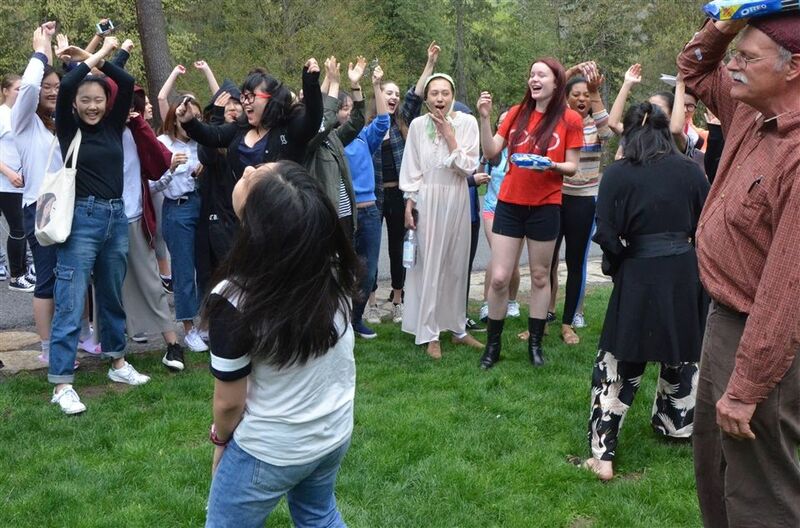 To their credit, the Juniors tried to give the seniors a run for their money by winning two of the dress-up days. For their prize, the Senior Class chose an off-campus dinner out at a location still be to determined. Congratulations on having awesome school spirit, Seniors! Racing for the Dizzy Bat relay. 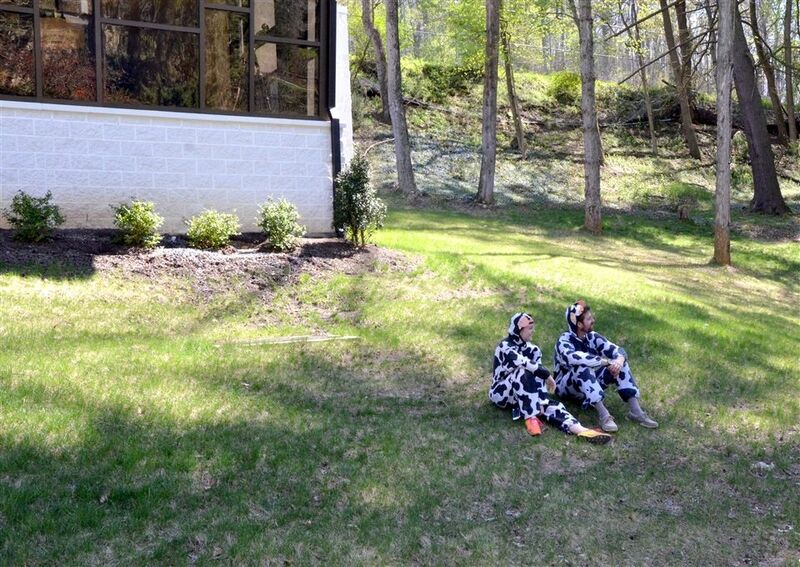 Cows in the pasture on Twin Tuesday. These students have a good system for the three legged race! Oreo Face Race hilarity in the rain. Wacky Wednesday Maggie A. and Katie S.
Throwback Thursday with Katie S., Bella W., Bella N., and Rachel S.
Students and teachers in their Grier clothing leap frog in the rain.